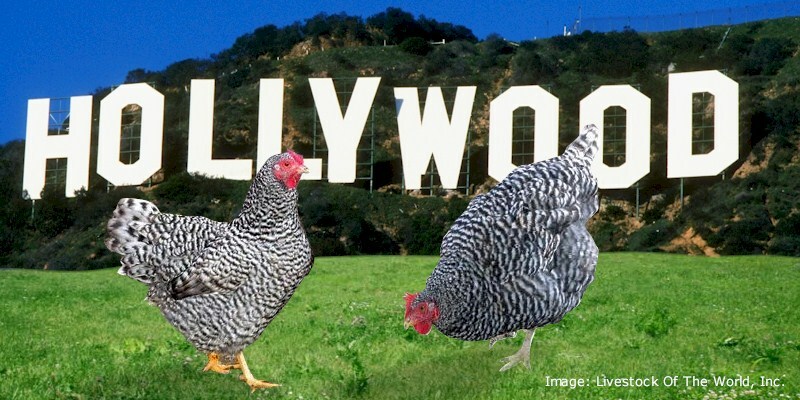 Barred Plymouth Rock chickens are a very popular and heavy dual purpose breed with alternating black and white stripes. On the other hand, White Leghorn chickens are white, small in size and excellent white eggs layer. The result was a naturally autosexing breed with gray barred plumage. They are not as large as the Barred Plymouth Rock chickens but heavier than the White Leghorn chickens. Being a crossed breed, California Gray chicken breed have never been admitted into the American Poultry Association’s Standard of Perfection. California Gray chicks are primarily black with a white spot on the top of the head. And the chest, abdomen and wing tips are white. Young pullets (females) are darker in color than the young cockerels. So, gender of the young birds can be easily determined by color. Feathers of mature birds are barred, black and white, and the hens are darker black than the roosters. Their color is similar to the Barred Rock, but the body style more resembles the Leghorn chicken breed. Their shanks and toes are yellow. They have a single red comb. They have small white earlobes and red wattles. On an average, California Gray roosters weight about 2.5 kg and hens about 2 kg.